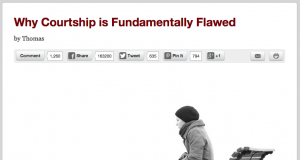 A few days ago, an article entitled Why Courtship is Flawed popped up in my Facebook feed. I read it and noted the thousands of likes and shares. I think the author did a good job of defining his terms and being clear. But there are a few important points that I disagree with. I don’t usually blog a response, but I wanted to answer some questions for the young men I’m discipling. 1. I disagree with the suggestion that people are divorcing because they courted. People divorce because of sinfulness on one or both of the people involved. People who date get divorced; people who court get divorced. Some people who seem like the perfect couple get divorced, while many couples who nobody thinks will make it last a lifetime. The secret was not how they met or what their relationship was like before marriage. It’s about their willingness to die to themselves out of love for the other person. 2. The article doesn’t say this outright, but it lumps singleness along with divorce as a negative consequence of Courtship. It’s almost saying, “Courtship leads to Singleness or Divorce. Dating leads to Happy Marriages.” Like I said earlier, that’s not true at all. And Singleness is not a sin or a curse. Divorce is caused by sin. Singleness itself is not. The Bible reminds us in the New Testament that because of Jesus, single people can live lives that are God-honoring, significant, and satisfying, just like married people can. 3. 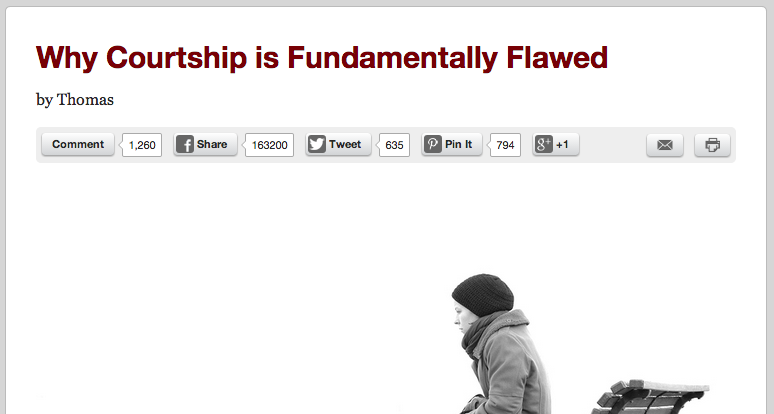 I appreciate the article making the case that the model of Courtship isn’t the best. He’s right. Every model will disappoint us at some level because we are all imperfect and sinful apart from Jesus. But then he proposes his definition of Dating as a better model. I’m sorry, but Dating is Fundamentally Flawed as well. It’s Fundamentally Flawed because Everything’s Fundamentally Flawed. Human beings who choose to act selfishly and unlovingly will ruin their relationships regardless of what philosophy they follow. 4. Every love story will be different! I have a friend who had dreams, visions, and prophetic words about his future wife. I have another friend who went after his wife but was shot down, then he stayed around, tried again and they’re married now. I have another friend who was classmates and churchmates with this girl. They started as friends and eventually got married, no complications. As for Carla and me, I was attracted to her character, our chemistry, and her killer good looks. I had to be with her. She was magnetized by my raw, overpowering, unrestrained manliness. And that was it for us. Don’t copy someone else’s story. Trust God for your own. Our process was 5% Dating, 5% Courting, and 90% Whatever It Takes to Get This Girl to Marry Me. Don’t rush into intimacy – physically or emotionally. A great rule of thumb is to always match the level of intimacy with the level of commitment. Taking it beyond that would result in disappointment and hurt a lot of the time. Most people don’t marry the first person they’re attracted to. I’ve seen people develop unrealistic expectations for relationships because they want their first date to end in marriage. This can make them overlook major warning signs in the relationship. If you end up together, that’s great. If not, don’t sweat it. That being said, it’s wise to date with the intention of pursuing someone for marriage. To date for pleasure, companionship, or just because everyone else is doing it is purposeless and potentially hurtful. Get advice from people you know and who know you. Find a married couple that has a relationship you admire. Ask them for their insight. You’d be surprised about how even the most intelligent and well-meaning single person will be mistaken about things that are basic to married people. Trust God in this area. Pray. Like everything else, we all make plans but it’s God’s purpose that prevails. Part of trusting God is honoring the authorities he’s placed in your life. If you’re a child (definition: living in your parents’ house and surviving because they give money to pay for your life) then you should submit to your parents.